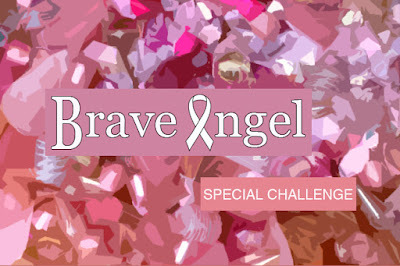 Today marks the reveal for the Brave Angel Special Challenge. If you're not familiar with the challenges, they're a fun way for folks to push themselves creatively, by working from a selection of components that I put together. 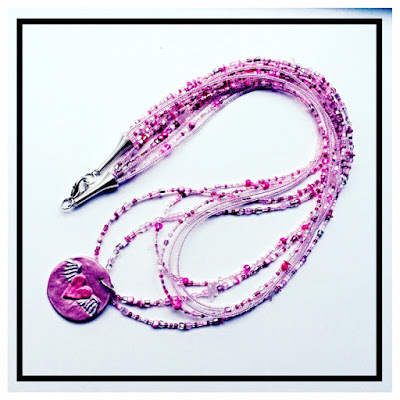 When we were talking about kits that we wanted to create, I knew that I wanted to make one that helped raise awareness for breast cancer treatment and prevention. I was really blown away by how quickly the kits sold out. (So many people were disappointed that they didn't get a kit that we had to do a second run of kits!) It was a bittersweet feeling though. Mainly because many of people who claimed kits were either breast cancer survivors or know someone who battled this disease. It shines a new light on things when you go from the conceptual idea of creating a kit, to meeting people who have had firsthand encounters with the disease. It made me think of all the people that I have lost along the way to breast cancer. It was a truly humbling experience and I'm proud to be able to present this kit. To find out more about what was in the kit, CLICK HERE. This was the Mystery Component that I created for the kit. It was made of polymer clay and hand-painted by me. After I sent everything out, I found out that the fixative that I used to seal the pieces didn't fully cure and caused the pieces to be slightly sticky. I was really heartbroken to discover this, because I spent a lot of time making them. I have to apologize to anyone who received them, as it was not my intention to send anything out that was not perfect. (Some folks said that their pieces were fine and others got sticky ones.) I've tried to reach out to everyone who got a kit, but if I didn't get a chance to, just let me know if you got a tacky one and I can replace it. (Alternatively, the pieces can be washed in warm, soapy water and recoated with a different sealant and that should do the trick.) Once again, I apologize and hope folks found other things to work with in the kit. This piece was made by Denise Slass-Lipson. Here's what she had to say about it: "My necklace includes many beads from the kit. 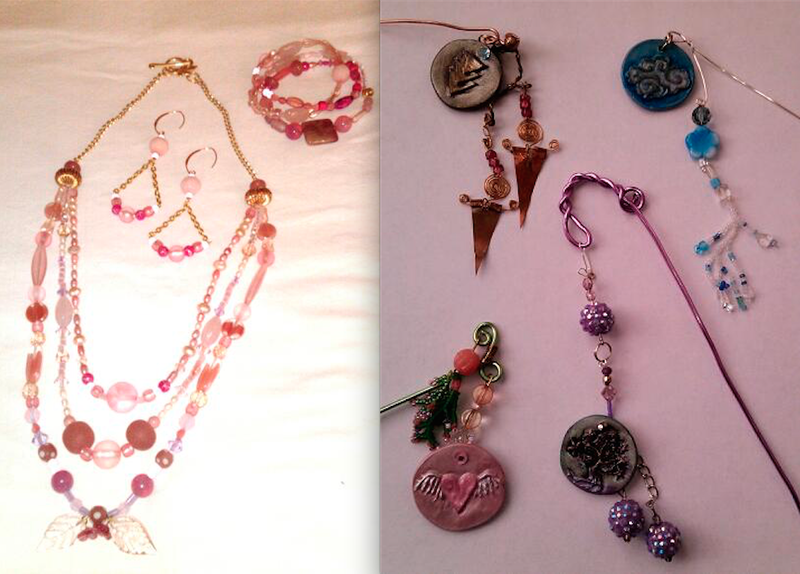 From my stash, I have added a small mirror, Czech glass beads, crystals, and flower sequins. I love to work with flower sequins and frequently add them to my bead embroidery to carry the eye from component to component. 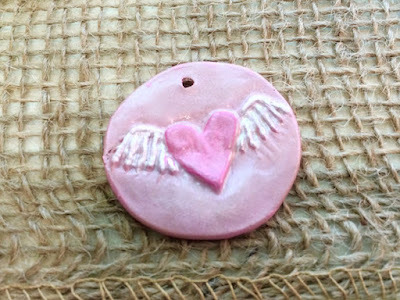 This piece contains two hearts – one to fly like the wind faster than caner and the other to show my heartfelt wish that someday soon we will see cancer cured. There is a small local craft fair next month and I have taken a table. I will exhibit it there and silently auction it off there." The next five pieces were made by Angela Taylor. Here's what she had to say about them: "Here are the pieces I made from the Brave Angel kit. The first bracelet was inspired by Stephanie Sersich and her spiny knotted bracelets and the amazing bead mix." 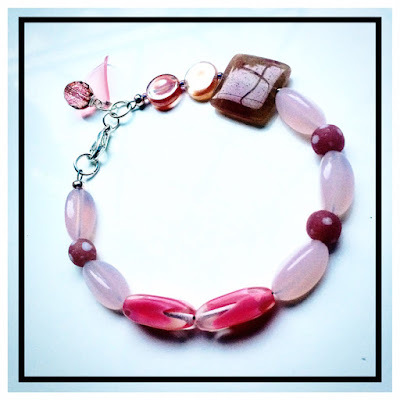 Another bracelet by Angela Taylor. A pair of earrings by Angela Taylor. A necklace made by Angela Taylor. 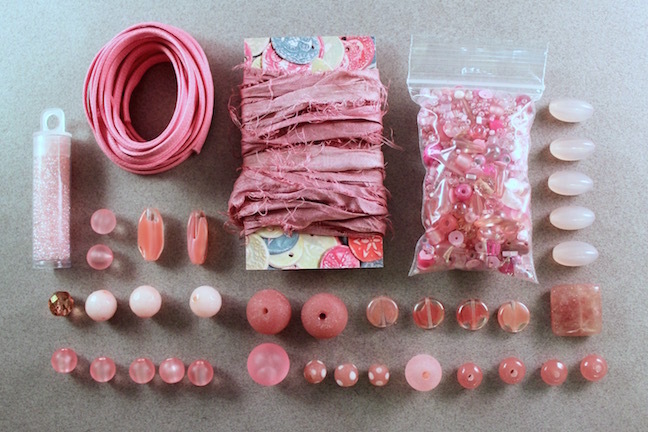 These pieces were made by Melissa Wynne. Here's what she had to say about them: "Thank you for another fun challenge! Loved the colors and bead selection and the meaning behind the name of the challenge. I also wanted to show everyone the "Plant Pokes" that I made using the beautiful medallions. At first, I'd put the Mystery Components in my beadwork, but then I thought they were too beautiful to be hidden away with my jewelry. I wanted to see them more often. So I thought I'd design them using sample/test beadwork pieces that I make." 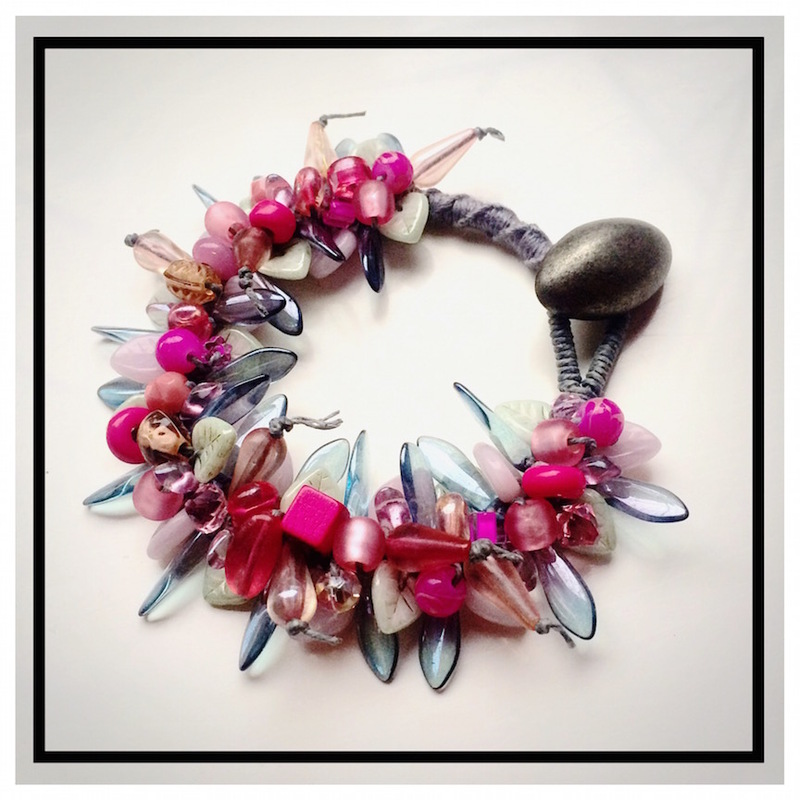 This piece was made by Donna Krtil Hoblit of VeraDonna Treasures. Here's what she had to say about it: "I call this piece, "Lend a Hand with Love". It uses one of my favorite "Andrew" creations. This piece will be donated to a local cancer organization to be auctioned at one of their events." This necklace was designed by me and is up for auction. To find out more about it and to bid, CLICK HERE. 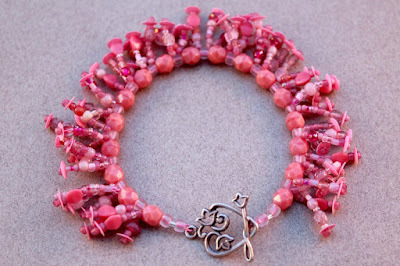 This bracelet was designed by me and is also up for auction. To find out more and to bid, CLICK HERE. We hope you'll check back here throughout the weekend and bid on some of the auction pieces! 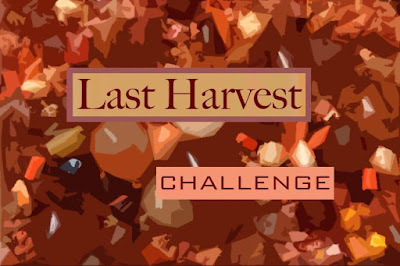 Up next is the Last Harvest Challenge. I have scheduled the reveal for Thursday, November 6th! So make sure to swing back around and see all the amazing creations! Denise I am amazed at the intricate details of you beaded bezel! It's gorgeous! 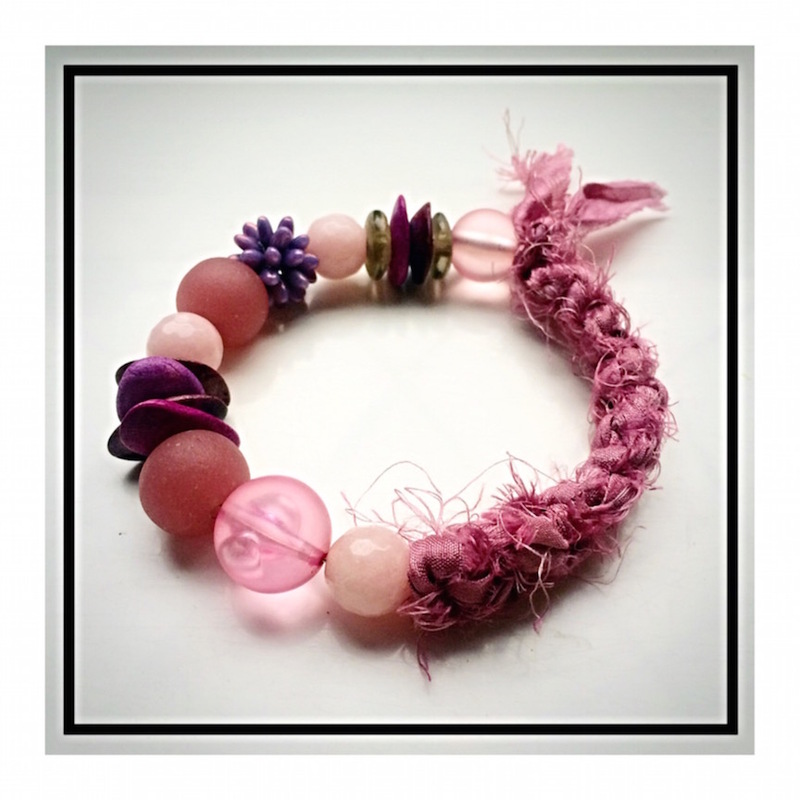 Angela I just adore your spiny knotted bracelet! I must try that soon! Your earring are perfect as well, the grey cord really makes the pinks pop! Melissa I am in love with the earrings in you set! The earwires are perfect with the drop style. Plant Pokes are the best thing I've seen all day! What a great way to show off some of your stash! Donna your style is wonderfully unique and you are able to pull it all together so seamlessly! Andrew I can 'see' the motion in your bracelet, it's so fun and in-style! Denise's necklace is beautiful. I love the way she used the Mystery Component and the message of the two hearts. I bet your necklace with fly away at the silent auction at your craft fair! Angela's bracelets are amazing! i especially love the first one - WOW. But they all have such great color balance and texture. 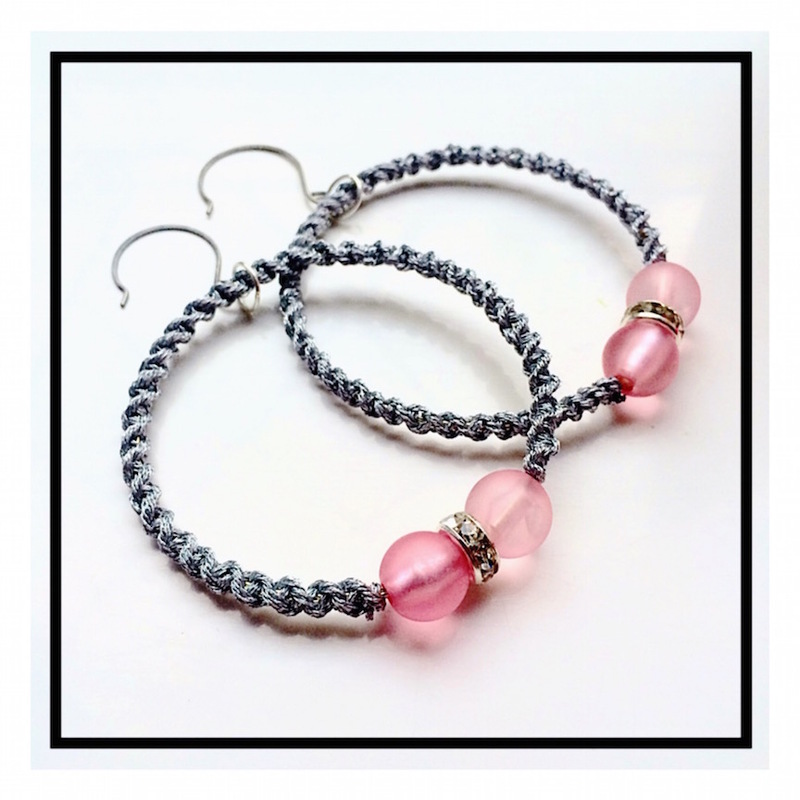 The earrings are great - I love the combo with the grey! 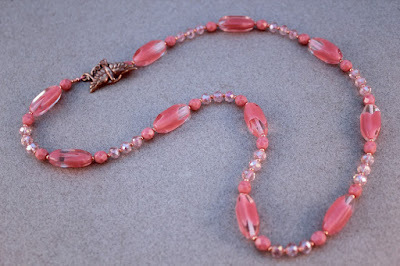 The necklace is a wonderful use of the Mystery Component along with a variety of beads from the kit. Melissa's pieces are great. I love the plant pokes! They are such a wonderful way to enjoy the Mystery Component's and Andrew's work every day! I love Donna's piece. The hand and heart pendant along with Andrew's heart and the other charms is perfect. Andrew's pieces are beautiful, as always. I love that bracelet - the pop colors, the fringy fun! I'm off to place my bid! Thanks for another wonderful challenge, Andrew.